As Custard and Darren have said ...... filp up the cap at the bottom of the arm to reveal the nut, remove and reset arm on the spline to the park position as shown below. I should have made it clear, the wiper is properly attached to the splines, it’s just not rotating the correct amount..... moving it down means there is an unswept area in the middle...that would be an mot issue. Last edited by mettersl on Tue Apr 24, 2018 6:46 am, edited 1 time in total. The linkage arm positions are critical. I don't have a picture but will see if I have a mech out a car I can photograph. Roughly from a while back ....It should be somewhere near, you may just need to position the linkage to the motor slightly further round so it lines up but is all relative. Looks like that link is not dead center but you can see it. 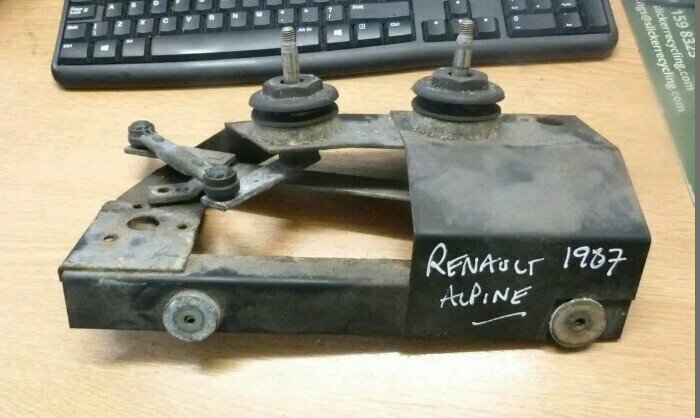 One for sale on eBay..the photo might help (ex Cedric I think)..though without motor in place may not be so useful. I know I did mine way back...trial and error. If you are time poor maybe make them an offer.. There are two adjustment points...one is the motor angle when parked the other is the intermediate crank position - unfortunately neither picture has the motor mounted. I've got the RHS working fine (by trial and error), what I hadn't appreciated is the other adjustment seems to impact the stroke of the LHS wiper. As I think its fine for the MOT, I think I'll leave this for now and add this to the "post macon" list. BUT if anyone has a picture of a RHD mechanism with the motor mounted and at the park position, that would be great. Wipers need to come out for more adjustment...but I’ll leave that for now...it’s ok for mot. Phew...this took me ages..,thanks for the help from everyone I asked about this...helped me get there in the end. Fingers crossed for the mot, l would not worry about the wipers because at the moment the long range forecast is showing no rain for the hole event might even see some sun, but probably high level clouds down there as there is so much snow in the mountains all evaporateing. Can I have my long stainless bolts back then please What are the chances? mixture/idle need some work, and a few other niggles will need attention this wee BUT IT passed.......fog light bulb needed changing (not sure how I missed that). Aside of that all seems to be working...and its LEGAL(and no advisories either) !! Last edited by mettersl on Sat Apr 28, 2018 4:54 pm, edited 1 time in total. Very well done Lee. I need to MOT mine, even finding the time is a hassle at the moment. Two new tyres to go on the front too with new metal valve stems... hopefully cure the mystery slow puncture.